The Butterflyfishes are found in the family Chaetodontidae in the order Perciformes. This family contains over 100 species divided into 10 genera. All the species are marine or brackish and several of them have been successfully kept by aquarists. 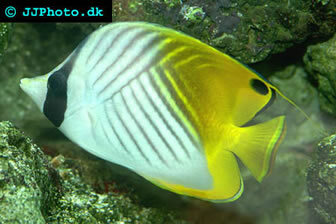 As the name suggests, a butterflyfish is a flamboyant creature that adds colour to the aquarium. It is very important to research the feeding habits of the species you are interested in before you decide to get it because some species of Butterfly fish are very tricky to feed in captivity. The marine butterflyfishes are not closely related to the freshwater butterflyfish of the family Pantodontidae in the order Osteoglossiformes. Butterfly fish are found in tropical to temperate parts of the Atlantic, Indian Ocean and Pacific Ocean. A majority of the species live in tropical parts of the Indo-west Pacific. Butterflyfish will typically stay near coral reefs in shallow waters and rarely venture deeper than 18 meters (60 feet). There is however exceptions to this rule and some species have been found 180 meters (600 feet) down. The butterflyfish is active during the day and will seek shelter in a crevice or similar during the dark hours. The butterfly fish will also change colours in the evening to stay more camouflaged during the night. The butterfly fish will typically stick to a specific home range. The species that feed on corals are especially territorial and will form pairs and together claim a specific coral head that they defend from intruders. Species that feed on zooplankton are less territorial and will live together in large groups. The feeding habits vary from species to species and it is important to research the particular species that you are interested in before you make purchase. Some are generalist and can be fairly easily adapted to various foods while others are specialists and will starve if not provided with a very specific diet in the aquarium. Some species do for instance appreciate an omnivore diet comprised of items such as small invertebrates, coelenterate polyps and tentacles, fish eggs and filamentous algae, while others feed primarily on planktons. There are also quite a few species that feed on coral polyps and sea anemones. Such species are tricky to keep by aquarists since it is hard to get corals and sea anemones to grow fast enough in captivity. Most aquarists therefore chose omnivore or planktivore species of butterflyfish. The Butterfly fish is a pelagic spawner. The female butteflyfish will release the eggs into the water and the male will fertilize them. The eggs are buoyant and will intermingle with the plankton and follow the currents. Most species form pairs, but they do not guard their offspring. After the larval stage, the fry will develop large bony plates that extend from the head and protect the body. This is called a tholichthys larval stage and has only been observed in Butterflyfish and fish from the family Scatophagidae in the order Perciformes. As the offspring matures, it will lose its plates.